If someone gave you two minutes to define the Truth, what would you say? And if you were asked to step inside a recording booth set up within a giant inflatable sculpture to address that question, would your answer come more easily? That’s what three artists who formed the Cause Collective—aimed at bringing the “public” back into public spaces through art–are determined to find out with their fantastically inventive Truth Booth. 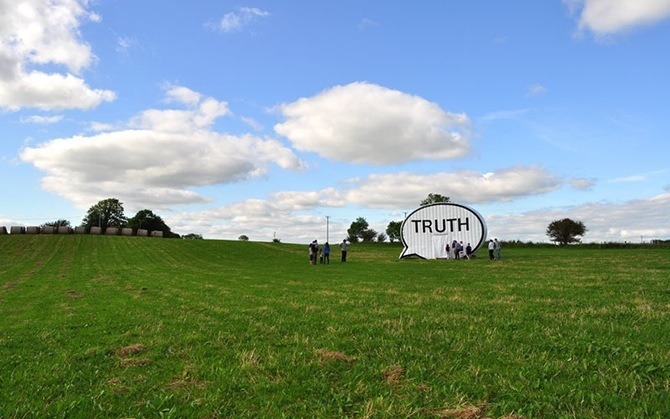 Shaped like a cartoon-speech bubble with TRUTH boldly printed on the side, the Truth Booth was created by Ryan Alexiev, Jim Ricks and Hank Willis Thomas, who met while studying at the California College of the Arts in San Francisco/Oakland. In 2006, they’d originally developed a project, The Truth Is I Am You in the Socrates Sculpture Park in New York, that later led to a permanent installation at the University of California San Francisco. Over 300 feet long, it lines a covered walkway and showcases 24 native languages, form Amharic to Urdu, spoken by the diverse student population at UCSF. A single line from a poem written by Ryan and Hank was translated into each different language, with the phonetic spelling in English and visuals in sign language. The truth is I love you. The truth is I know you. The truth is I see you. The truth is I hear you. The truth is I fear you. The truth is I feel you. The truth is I adore you. The truth is I respect you. The truth is I follow you. The truth is I judge you. The truth is I choose you. The truth is I remember you. The truth is I remind you. The truth is I frighten you. The truth is I become you. The truth is I believe you. The truth is I resist you. The truth is I am you. The Truth Booth then traveled around arts fairs and rural community events, popping up at the LOOK3 Festival in Charlottesville, VA, the Hofstra University-hosted presidential debate in 2012, and on the campus of George Washington University in January 2013 before traveling to Afghanistan in August and most recently to Cleveland. Next stop is Pakistan. While the blow-up Truth Booth continues its global travels, the hundreds of hours of video are being edited; some of the results can be seen on the project’s website: insearchoftruth.net. The trio’s ultimate goal is to edit the videos into a documentary and a book of photographs, set in iconic landscapes juxtaposed with respondent’s faces posed against a simple, white background. To speed up the process, they’ve teamed up with Free Press Unlimited, and they also plan to create a permanent website that will give visitors an interactive platform where the videos are searchable by geography and category. Whatever happens in the future, The Truth Booth has already changed Cause Collective’s approach to art-making, making work that is more rewarding, inspiring, and empowering. “I feel like it’s a process,” Ryan says. “When we started in Ireland we had no idea what we were going to get. Hopefully the answers—or the Truth—will come out. I just want to keep going. The Cause Collective is a team of artists, designers and ethnographers creating innovative art in the public realm. Their projects explore and enliven public spaces by creating a dynamic conversation between issues, sites and the public audience. By exploring ideas that affect and shape society, they seek to add the ‘public’ back into public space and art. To support the quest for Truth, contact info@insearchofthetruth.net or Cause Collective, 1777 Yosemite Ave., Suite 305, San Francisco, CA 94124.